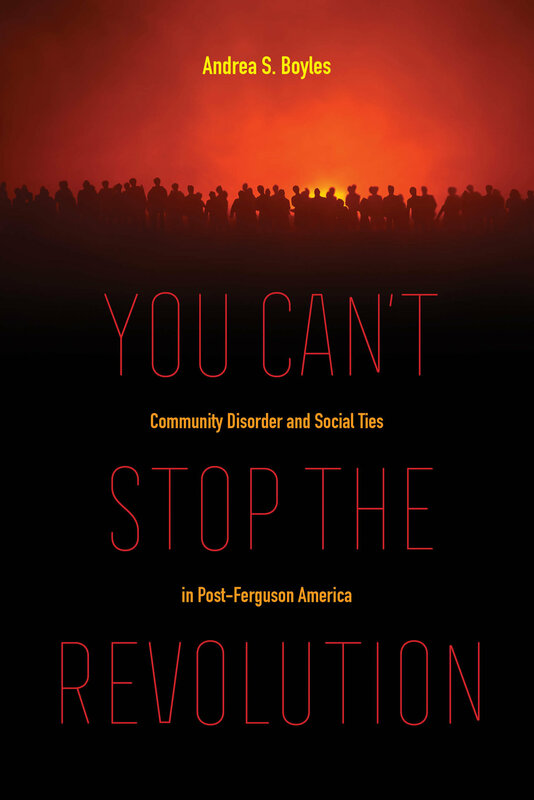 You Can’t Stop the Revolution is a vivid participant ethnography inside of Ferguson protests, as the Black Lives Matter movement exploded onto the global stage. Sociologist Andrea Boyles offers an everyday montage of protests, social ties, and empowerment as coalescing to safeguard black lives while simultaneously igniting unprecedented 21st-century resistance. Focusing on neighborhood crime prevention and contentious black citizen-police interactions, all in the context of preserving black lives, this book examines how black citizens work to combat disorder, crime, and police conflict. Boyles offers an insider’s analysis of cities like Ferguson, where the socialization of indifference leaves black neighborhoods vulnerable to citizen and state conflict, all in a climate where black lives are not only seemingly expendable but also held responsible for their own oppression. You Can’t Stop the Revolution serves as a reminder that community empowerment is still possible in neighborhoods infected with police brutality and interpersonal violence. Andrea S. Boyles is Associate Professor of Criminal Justice at Lindenwood University, Belleville. She is a feminist, race scholar, and the author of Race, Place, and Suburban Policing: Too Close for Comfort.